Real estate in Florida, whether it is an estate, an interest of freehold, or a lease for a term of more than one year in any land, tenements, or hereditaments is created, made, granted, transferred, or released by a deed in writing, signed before two subscribing witnesses by the party granting the estate. Further, no estate or interest, either of freehold, or of term of more than 1 year, in any lands, tenements, or hereditaments will be assigned or surrendered unless it is by an instrument in writing, signed in the presence of two subscribing witnesses. (689.01). A statutory form for a warranty deed appears in 689.02 of the Florida Revised Statutes. A conveyance may be in substantially the following form as provided by statute and must contain words of conveyance or a granting clause. The warranty deed, which contains covenants of title, is a popular form for a conveyance of real property in this state. Any person of lawful age may enter into a conveyance of real property in this state. Individuals as well as those claiming jointly may convey and hold property. Further, corporations can convey and execute any and all conveyances in accordance with the provisions of 689.01 of the Florida Revised Statutes. Florida regulations regarding alien land ownership are as follows: The ownership, inheritance, disposition, and possession of real property in Florida by aliens ineligible for citizenship may be regulated or prohibited by law, according to the Florida Constitution, Article 1 section 2. A conveyance of real estate, including a homestead, made by one spouse to the other, will convey the legal title to the grantee spouse, and the grantee does not need to execute the conveyance (689.11). The method of conveyance is determined by the owner's rights to the real property, the grantee's legal capacity to receive title, and the intentions of the parties involved in the conveyance. In order for an instrument to be considered for recording, the execution of it must be acknowledged by the party creating it, proved by two subscribing witnesses, and legalized or authenticated by a civil-law notary or notary public who affixes his/her official seal to the instrument (695.03). Acknowledgements made within the state of Florida may be made before a judge, clerk or deputy, clerk of any court, or any officer listed in section 695.03. A deed without witnesses will not vest title in the grantee. Section 695.26 of the Florida Revised Statutes lists the formatting requirements for recording an instrument that affects real property. No conveyance, transfer, or mortgage of real property, or of any interest therein, nor any lease for a term of one year or longer, is good and effectual in law or equity against creditors or subsequent purchasers for a valuable consideration and without notice, unless the instrument is recorded according to law. A real estate deed in Florida needs to be recorded in the county where the property is located. Instruments are deemed recorded from the time of filing. The act of recording provides notice to all persons, but an unrecorded instrument will still be valid between the parties to the instrument. Priority of documents is determined by the sequence of official numbers that the county recorder places on a document upon receiving it for recordation. An instrument with a lower number in the current series of numbers will have priority over any instrument bearing a higher number in the same series. 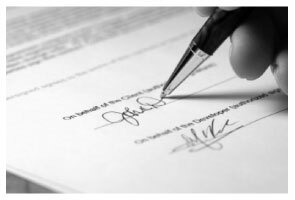 Quitclaim deeds are given protection under the Florida recording acts. Specifically, grantees by quitclaim deed are deemed and held to be bona fide purchasers without notice (695.01).